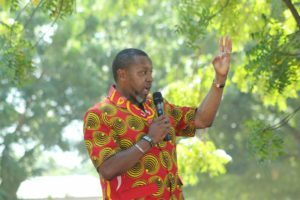 CHIKWAWA-(MaraviPost)-May 21 tripartite election front-runner, Dr Saulos Chilima, has reiterated his call for Malawians to stop glorifying political leaders who love to personalize obvious public matters. 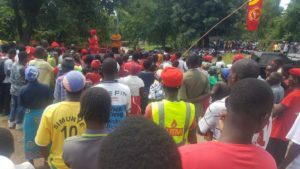 Addressing large crowds that patronised his whistle-stop tours in Chikwawa district on Tuesday, the UTM president said time has come for ordinary people to start getting credit for whatever development takes place in the country. 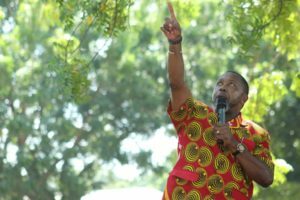 “Any development that you can talk about happens using money from your taxes, therefore all of you should take credit for the roads, bridges, schools or clinics that are constricted in the country; not one or few individuals, no!” Chilima told the masses. “Stop worshiping political leaders. Of course, just like every individual, they deserve respect, but don’t go as far as worshiping them as if they are small gods; that is wrong,” the charismatic transformative leader stressed. During the tour that had stopovers at Chididi, Tengani, Mkumaniza and Ngabu, Chilima pledged the UTM’s commitment to revitalise the country’s agriculture as bedrock for economic development. 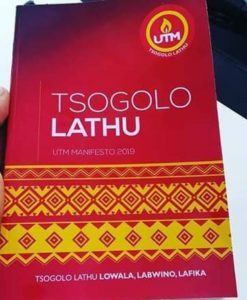 He said through prudent management of resources, the UTM administration will start paying chiefs decent honoraria arguing that it is disrespectful of the current government to be paying the traditional leaders less than the minimum wage. He also condemned the practice by some politicians who interfere in chieftaincy matters saying such issues should be left to be handled by respective royal families. On public and social services, Chilima said among several priorities the UTM government will ensure that civil servants are adequately remunerated and housed as well as fulfill its promise to put all persons aged 65 and above on pension starting 1st July this year. “The UTM wants all Malawians to start believing that everything is possible; everyone who says ‘it is impossible’ to our developmental proposals is an enemy of Malawi and its people and should therefore not be given the mandate to govern on 21 May,” Chilima said. During the tour, the UTM president also toured a couple of flood victim camps where he pledged assistance to the devastated people. The question is should we denounce the political leaders when they don’t do development? The same answer we give to the foregoing question must be expected when a political leader does development.